If you search your ancestors in Belmonte Calabro, Calabria, info about your Italian family are stored in the City Office archives or at the parishes. In towns and villages of Calabria and in Cosenza province registry offices were established in early 1800: it means that you could find information in Belmonte Calabro registrar as of that date. So, if your ancestors were in Belmonte Calabro in the nineteenth or twentieth century, then you could try to contact the City Office of Belmonte Calabro to know more. 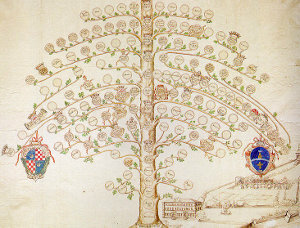 Before to start your genealogy research in Belmonte Calabro, we suggest you to read our tips for your search . They are useful to search in Calabria and in Belmonte Calabro too. 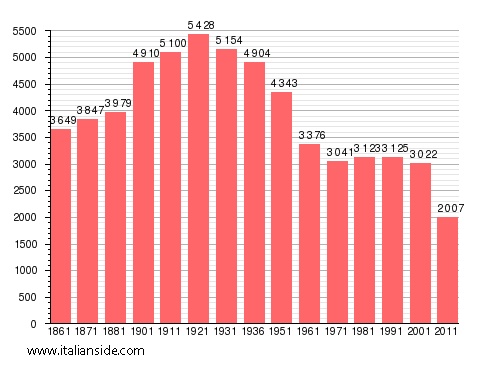 Next picture shows the demographic trends in Belmonte Calabro from the Italian Unification (1861) an important info to understand how many people lived there in the past. It could be important to know if the last name you are investigating is a frequent surname in Belmonte Calabro. As more your surname is common in Belmonte Calabro, as more it could be difficult to find the right info about your ancestors in Belmonte Calabro archives if you have not exact dates. If you have the opportunity to visit Belmonte Calabro and Cosenza province, you could plan to investigate churches’ archives by yourself, but from abroad is very difficult to obtain any result unless you find a reliable local help. If your research is in a dead end and you need professional help from our local Italian genealogists write to belmontecalabro@italianside.com our expert in Belmonte Calabro area will study your request and will reply to you with a research plan and a quote. Looking for the parents of Saverio Pati born in Belmonte February 25, 1887. He migrated to the US in 1903. Thank you. Sono interessato a scoprire se mio marito ha ancora una famiglia a Belmonte. Il suo cognome è Ianni. Suo nonno emigrò nel Bronx, a New York, negli Stati Uniti nei primi anni del 1900. Il suo nome era Giovanni Ianni. Hi. I am hoping you can help me. My great-grandparents were from Belmonte Calabro. I am looking for their parents names and birth dates and any further info you may come across for my great grandparents. My great grandfather , Carmine Caruso, was probably born around 1850-1860. My Great-Grandmother was Innocenza Osso. In 1889, they lived at Casita(? )Annunziata No.70, Belmonte Calabro where my grandfather, Antonio Caruso, was born. If you can find any info, it would e greatly appreciated! I am from the Marano family from Belmonte Calabro. I happen to know that Bonaventura Maran is the clerk at the records sections in that town. If you get with him, his Dad was Tony and he came to the USA but went back. The dates are about right. Bonaventura would have to have his wife Gina translate for him. I am trying to find out information on the Pinnicchia family that was from Belmote, Calabra. Are you able to help me. A friend of mine passed away in 2011 and he left me a wooded crucifix with a wax Jesus Christ with the desire that it put somewhere special. The information I have on it shows it once belonged to Bishop Eledoro Marano in the 1800’s. He gave it to his nephew Frank in 1904 when Frank came to America. It says the Family Marano was from Belmonte Calabro Calabria Italy. I am trying to find any information on the Bishop or the wax crucifix so I can determine where it should go. If you would like pictures of the crucifix, let me know. If you would like to start a research in Belmonte Calabro please send your request to belmontecalabro@italianside.com.